What fancied me most from the moment I stepped on the streets of New Delhi was the Cycle Rickshaws. As a person from Kerala, were auto-rickshaws are the most prominent taxi services; a man-ridden three-wheeler with pedals and a comfortable place for utmost three travellers at a time to sit was an alien thing to me. 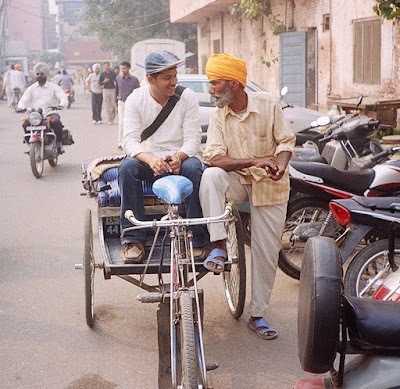 Let me say, it was my sort-of-ambition to travel on cycle rickshaw (pedicab) at least once before leaving North India. As we both were traveling the whole Delhi on a car along with our driver, it was almost difficult for me to travel around on rickshaws. I said my fellow traveller - the camera man - to capture some shots of the cycle rickshaws, so that on return we would be able to compile the visuals into a single short video and thus to circulate it through our website. Well…that was our purpose of North India visit too. To collect camera visuals of North Indian monuments and destinations and to prepare detailed notes of what we shoot. It was my suggestion to shoot the cycle rickshaws, but I don’t know how much seriousness the cameraman gave it. But after leaving Delhi, Agra and Abhaneri Kund in the order, we reached Jaipur and this time I made my long-desired wish a reality. While others were resting in the hotel room, I made a jaunt on a hired cycle rickshaw through the historic royal tracks of the city on the way back after browsing the Internet at a nearby café. But my interesting experiences connected with cycle-rickshaws were yet to had came. After reaching Amritsar, we went to Jallianwala Bagh on foot, as it was only a walk away from our hotel. When stepped out to the pathways with a hurrying traffic, after collecting visuals of the famous spot of Indian freedom struggle martyrdom, we decided to hire a cycle rickshaw to our room. It was a turbaned and bearded Sardarji who responded to our call. Clad in a loose fitting dirty shirt and pants, he was an old man speaking only in Punjabi fluently. I sat on the seat and the Sardarji looked at me with familiarity in his eyes. We smiled at each other and he just asked me a question in Punjabi. I think all of you know that Punjabi and Hindi are two different, yet look-alike languages. Though both are very much mutually intelligible, Punjabi is not a dialect of Hindi, it is a separate language. But, even in case of Hindi, I am a very poor person and I did not get what this Sardarji was talking about. I explained him in my poor Hindi about the train journey that I made from Kerala to reach Delhi as an answer to his some other question. I asked his name. He said something like ‘Diganthar Singh’. When I asked him his name again to confirm what I heard was correct; he just nodded approvingly, though I could catch something disapproving at his face. Anyway, I didn't attempt any further clarification. I handed my camera to our driver friend and gave him a signal to take the photograph of Sardarji with me on the cycle rickshaw. Sardarji was speaking eloquently about something and I showed my teeth in a colorful smiling manner pretending that I understand him very well. Then our driver clicked the camera and what I got was my all-time favorite photograph, which is given below. (Note that I am the handsome man sitting in the left and not the other one (:D)). One memorable comment i got for this photograph was from a Brazilian Orkut friend. She said this photograph has a typical 'Indianness' and reflects the true cultural spirit of India. He pedaled with us heading to our hotel. When the cycle reached at an upward slope he just dismounted from the cycle and began to push it against the inclination. All of us three got out of the cycle and began to help him in the process of rescuing the cycle from that slight inclination by smiling at each other. When he dropped us comfortably at our hotel we bid farewell to him and to his cycle rickshaw. I was very happy when my fellow traveller gave the Sardarji more than what he asked. I grew up in Delhi and your post brought back a lot of memories. You are right, there's a lot of difference between punjabi and hindi. Punjabis have this zest for life that I simply adore. I hope you enjoyed your trip to the northern part of the country. I grew up in Kolkata where the pedicab (we call it the rickshaw) is a very common sight. And Kolkata is full of Punjabi taxidrivers, but I am yet to see a Punjabi rickshaw-puller. Glad you had a nice time! I never knew that thr r punjabis driving rikshaws! i thot of thm like more of a proud folk! well thrs always a first tym...eh! i ws thr in delhi 2 mnths ago! hehe! bt was always on a bike! i like being fast! nice blog tho! Kolkata is ..I heard ..an amazing city..a historic one..Actually after my delhi trip the company has fixed my next trip to Kolkata..but before that I shifted to another place..
And obviously yeah..I had a nice memorable time.. Thanks for ur comment in my blog after a long time..yeah..Punjabis driving rickshaws..but it was not in delhi..it was in Amritsar where i found a Punjabi Rickshaw puller..and I wonder hearing u drove all the days on a bike, how on earth could you do that in the hurried traffic of Delhi..
Amritsar is very close to my Nanni house.. I have been to Kerala also and i like the beauty of Tea Plants and the back waters.. The cultures are different but the love is same for INDIA.. Thanks for suggesting me to read this post.. i loved it.. Thanks fr ur nice comments. I am happy when u wrote 'Rangla Punjab' as I felt that my post evoked ur memories about ur home place. Happy to know that u know all the places where some of my beautiful memories rest. Happy to know that u had visited Kerala and u know the beautiful tea plants and the backwaters about which I wrote many articles as my previous job was that of a tourism journalist. And I feel honored when u pointed out that the love for India is same everywhere in this country as that too was my point. This is a high-quality inspirational blog post My Pedicab Practices .You put actually very supportive knowledge I am pretty much happy with your dazzling work. Keep it up. maintain blogging. Looking to reading your next blog post.